This morning, me, my coffee and my breakfast were doing our morning wake-up routine. Email, CNN, little Tweeting and obviously creeping on the Facebook to get the day rolling. I found an article that I’ve been waiting to see for months. Thank Heavens! 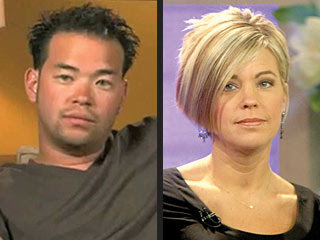 That scumbag Jon Gosselin is FINALLY leaving Jon and Kate plus 8. I love this show. I’ve been a fan of it from the beginning and the recent muckraking, whilst heartbreaking when I consider the precious little tots, has engaged my appetite for trashy gossip more than most stories (Competes only with the off-camera goings on of the Gossip Girl and Twilight starlets…swoon). It’s been hard for me not to bring my frequent editorial comments on this story to the blogosphere. But this I can’t ignore. Why in the world did it take TLC this freaking long to remove him from their network? I was on Team Jon at first, as I believe Kate has a slew of personality flaws herself, but he has done everything possible to disappoint me…and America (boom, Roasted). The womanizing, the ear piercing, the extravagant partying, the global vacations…TRYING TO GIVE AWAY THE DOGS. I hate him. 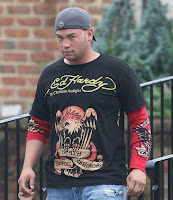 As a rule of thumb, I never trust anyone wearing anything Ed Hardy. I want to boycott him from my consciousness (I wish I had that the power to boycott various things from my consciousness: Miley Cyrus, mayonnaise, various indiscretions, etc. ), but sadly I lack that magic. I want the Duggars to host a moral intervention with him. Thats good television. The funniest part of it all is that now they’ll be calling the show just “Kate plus 8”. This brings me immeasurable giggles.. That woman is dying for a re-branding. Name of the show, hairstyle, snippity personality, come on lady change with the times. That’s all. Just wanted to weigh in on a nonsense cultural item. If only you all knew how many more I have a brewin’. "I want the Duggars to host a moral intervention with him. Thats good television."